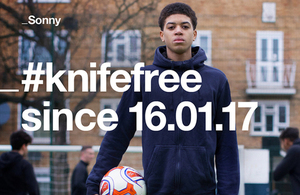 The UK Home Office has launched an anti-knife crime campaign with the aim of reducing knife crime among young people. The #knifefree campaign uses real-life stories of young people who have turned their lives around after making the decision not to carry knives, highlighting the harmful consequences of carrying knives and showing the positive alternatives. The adverts are based on new research commissioned for the campaign which found that showing real-life stories of young people talking about their experiences with knives resonated with the target audience. For more, see the #knifefree website which provides advice, signposts support services and highlights activities to empower young people to change their behaviour.